The virtue of Rihanna is her ability to make you feel concurrently inferior and powerful at the same time. 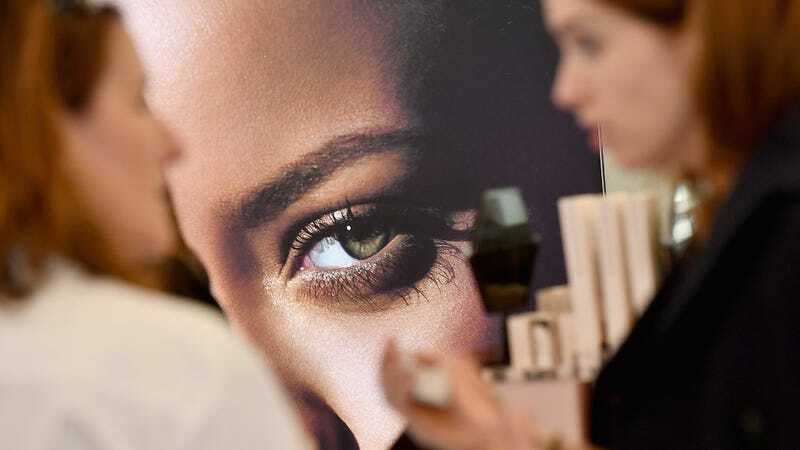 To celebrate her Fenty Beauty launch (which was available at midnight Pacific Time on the site, insensitive to East Coast bedtime), the star and her divine beauty debuted the line at Sephora Times Square at the start of New York Fashion Week. This isn’t just a matter of the Rihanntrepreneur wanting to make money in the makeup business and stack her empire. There’s higher value here. Once you parse through the breathless anticipation and habitual wonderment over her facial chemistry, what women appreciate most is that the Fenty collection is instinctually inclusive and accommodating of a range of skin tones, and that its existence italicizes how much women of color should be in position to create beauty products. There’s primer, foundation, lip gloss (the Universal Lip Luminizer), highlighter, concealer and brushes galore, all well-designed and with inventive, millennial-luring names like Killawatt and Pro Filt’r. A year ago, I wrote a Jezebel piece about the frustrating cycle for women of color in search of beauty products; I cited a growing number of black stars with beauty ambitions. Kelly Rowland teased a makeup collection called Face for women with darker complexions, and Angela Bassett has a line. But Rihanna’s launch has been far and away markedly well-executed, on top of being the most obviously coveted, given her cool factor and her capacity to offer—as a counter to the contour-focused Kardashian kingdom—a line focused on range and accessibility. There’s an inherent trust that Rihanna has our back, which is what branding executives love to hear, along with the consumer’s impossible belief that they could maybe look as flawless as her. So many of the makeup artists I talked to tonight were most impressed with the highlighter. It’s velvety and soft in texture, but not dusty, and the colors are unique. The shade to buy is one called Trophy Wife, a 24-karat yellow-gold shade that really pops on the skin. You can press it on as a highlighter, or dust it more loosely over your eyes for a pretty, glitter-dusted look. (This is what you see on Selena Forrest in the campaign video.) They also come in duos, with day and night options. Makeup is still a matter of glaring at swatches, mixing and matching, and no one line solves every person’s problem, but you can tell from the reactions—including my Group Chat activity, which likely resembles many others—that this representation is rare and meaningful. People—the regular ones and the beauty influencers—are glad Rihanna is making makeup.